For an embryo to lead to a healthy, live birth, it must have the proper number of chromosomes. 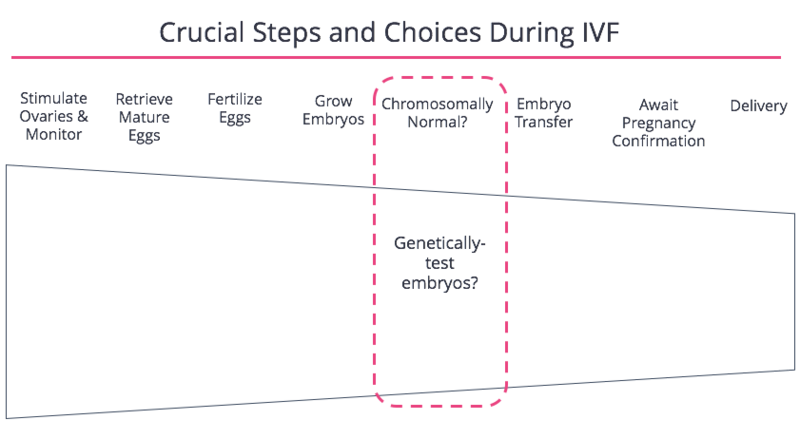 As the chart below shows, a relatively small percentage of embryos developed during IVF qualify as “chromosomally-normal” or “euploid.” As you can see, this phenomenon coincides with, and explains, why IVF success rates diminish with age. 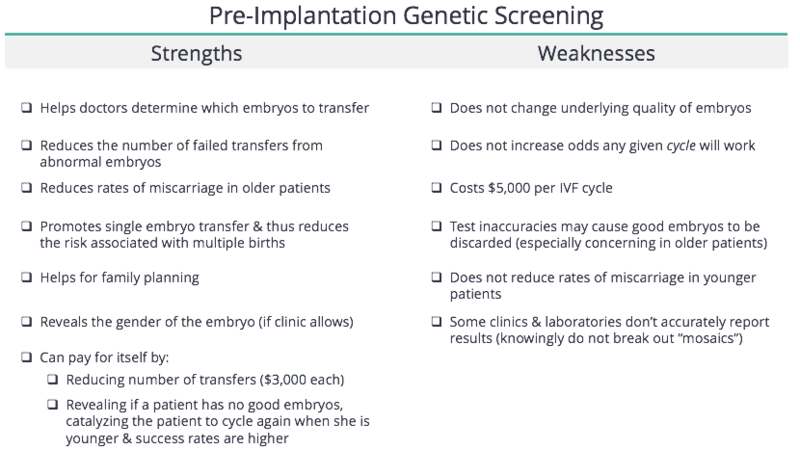 There are multiple tests to look at the genetics of an embryo, but in this lesson we’ll focus solely those used to predict the number of chromosomes, which is referred to as Pre-implantation Genetic Screening. Pre-implantation Genetic Screening (also known as PGS, CCS, or PGT-A) is a diagnostic tool to tell your fertility doctor which embryos are likely to be chromosomally-normal and thus which to transfer. To the positive, using PGS helps avoid transfers with embryos that are either unlikely to work — meaning it reduces the number of failed transfers and miscarriages — or transfers that would lead to the birth of an unhealthy baby. PGS also helps promote single embryo transfer, which reduces the risks to a carrier and offspring. Finally, PGS can help in family planning and reveal if someone’s frozen embryos are chromosomally-abnormal, will not work, and thus another IVF cycle makes sense sooner rather than later if they want more children. To the negative, PGS costs patients an extra $5,000 per IVF cycle and it does not change the underlying quality of a patient’s embryos. Said differently, doing PGS does not increase the odds that an IVF cycle will work. Furthermore, doctors fear that the test’s inaccuracies could confuse a good embryo for a bad embryo, meaning some patients will needlessly cycle again, or in more desperate circumstances, use donated eggs or give up on IVF altogether. During the PGS process, the fertility clinic’s laboratory will “biopsy” or remove 5 - 7 cells from a “blastocyst” embryo and send those cells to a “reference laboratory.” The reference laboratory will put the cells in a machine to predict the number of chromosomes for each embryo and then send a report back to the fertility clinic that characterizes whether an embryo appears “euploid” (correct number of chromosomes), “aneuploid” (incorrect number of chromosomes), or “mosaic” (ambiguous if the embryo is “euploid” or “aneuploid”). The clinic will then share the results with the patient and use the information to decide if there are embryos worth transferring and if so which ones. PGS is a tool that helps doctors decide which embryo(s) to transfer based on the likelihood each embryo will lead to a live birth. Euploid embryos are most likely to lead to a live birth and should be transferred first. Embryos that are mosaic can still lead to a live birth, but depending upon the type, do so less often, and carry some risk. Embryos that are aneuploid almost never lead to a live birth and if they do, carry major risk the child will be unhealthy. For these reasons, if a patient decides to transfer a mosaic or aneuploid embryo, they should discuss the implications with a genetic counselor. We should point out that many fertility clinics ask the reference laboratory not to break out “mosaic” embryos as a separate category. 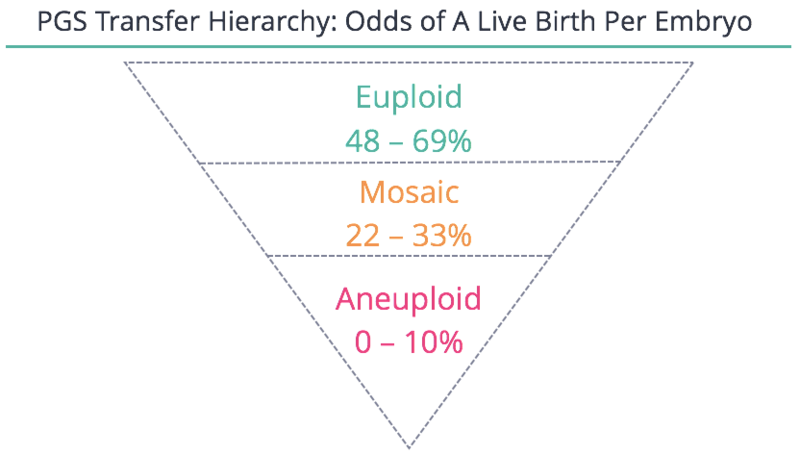 As a result many of these embryos are wrongly lumped together with “aneuploid” embryos, which have distinctly worse prospects than mosaic embryos. We believe patients must insist before signing up for PGS that their mosaic embryos will be accounted for separately and distinctly from euploid and aneuploid embryos. When women transfer PGS-tested (and approved) embryos, those embryos are far more likely to implant and lead to a successful transfer. This fact has two major implications. First, using PGS cuts down on the likelihood any given transfer will culminate in a failure or miscarriage, especially amongst older women. Second, women who use PGS and have euploid embryos to transfer are far more willing to transfer one embryo at a time. That matters because if a single embryo transfer culminates in a pregnancy, in only 1% of cases will it result in twins or triplets. In the case of multiple-embryo transfer pregnancies, p to ~30% culminate in twins or triplets. 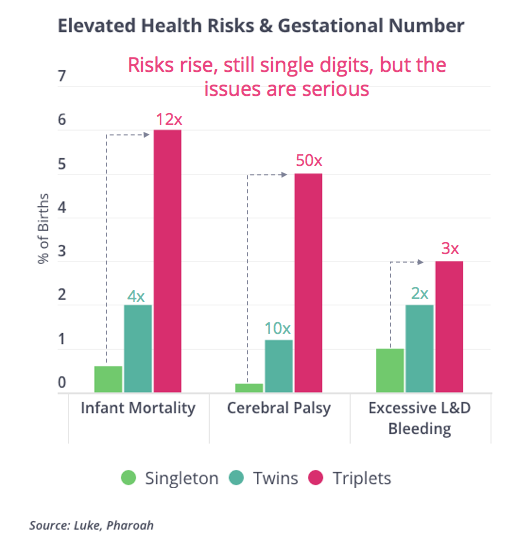 That’s a problem because multiple births can be dangerous to the mother and child, as you can see below. Finally, using PGS can help families if they want to have more than one child, likely with the help of IVF. 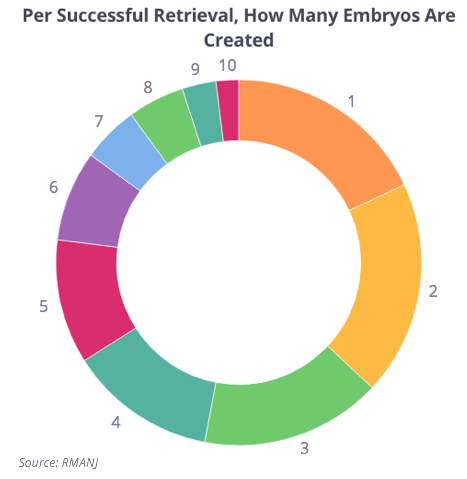 After a single retrieval, most patients create multiple embryos, as you can see below. Let’s look at the diagram below. In the case of family A, they created multiple embryos, but discovered through PGS only one was good. Since family A hoped for a second child, they choose to immediately cycle again in March, 2019. Now look at family B who also received one good embryo out of many and who wants to have a second child. Without the benefit of PGS they only learn years later their extra stored embryos won’t lead to a live birth. They start their next cycle in March, 2021. A whole two years later than family A. 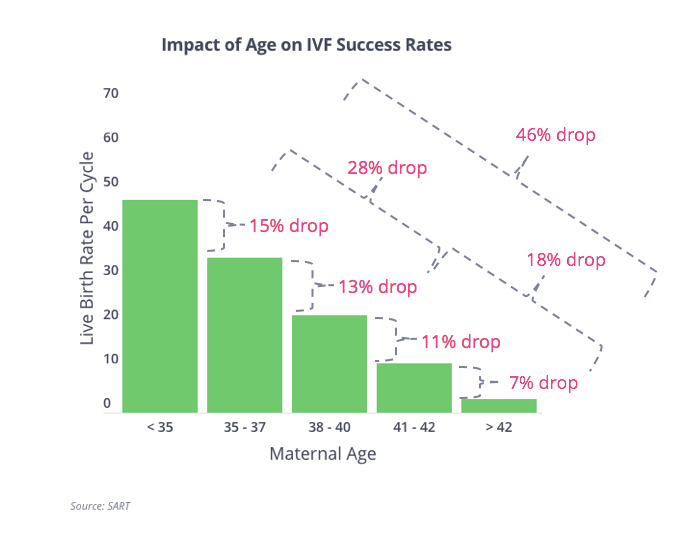 A two year delay can be significant, because as you can see below, the odds another IVF cycle will work drop precipitously with maternal age. If using PGS rightly helps a family cycle again two years earlier than they otherwise would have, it may improve the odds that IVF cycle leads to a baby by 2 - 4x (at $20,000 cost to the patient), in which case, the test likely paid for itself. Finally, PGS reveals the gender of the tested embryos. For some this is valuable information but does require the clinic’s permission for it to be shared. Today, about half of US clinics will allow patients to learn the gender of each embryo before transfer. Outside of the US the practice of sharing an embryo’s gender is largely illegal except in special circumstances. PGS is just a test of the embryos and using it doesn’t change the underlying quality of those embryos. As a result, using PGS does not change the odds that the embryos created from a cycle will lead to a live birth and thus doesn’t change the odds the cycle itself will work. 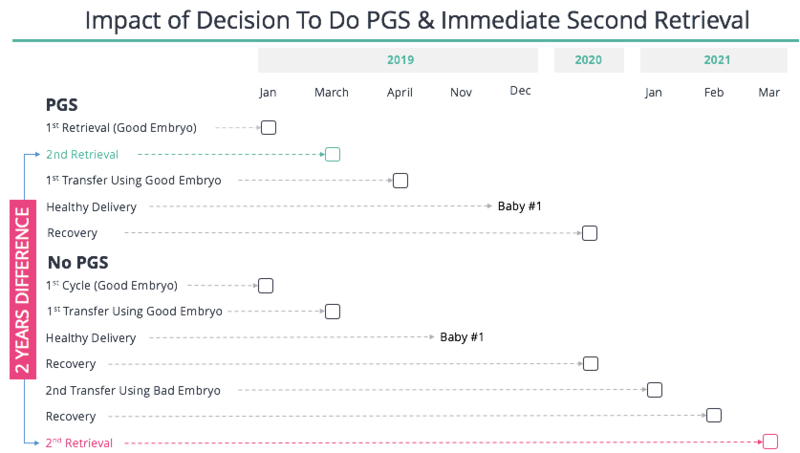 Next, PGS requires biopsying the embryo and there has been only one, small, single-center study that looks at how this impacts the embryo’s viability (the data was reassuring). Some believe that is insufficient evidence to show there’s no harm done. The next major concern with PGS revolves around the test’s accuracy. There’s data that shows similar patients (same ages, clinics 15 miles apart) who had their PGS biopsies run at different reference laboratories, get back very different results. If the test has inconsistent accuracy, many fear it can confuse a good embryo (euploid) for a bad embryo (aneuploid). The consequences of this would be especially dire for older patients, who struggle to produce any good embryos. Such a mistake might force a woman to needlessly undergo additional IVF cycles, resort to donor eggs, or give up on having a child entirely. 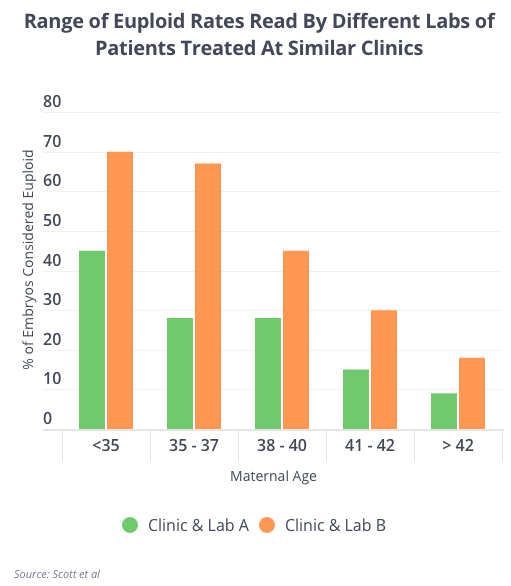 For this reason, many doctors are wary of PGS’s trade-offs in older patients with few embryos. However, some doctors believe PGS is wrong for younger women. As you may recall and can see below, PGS reduces the miscarriage rate most in older women, not younger women. Thus, if the test does not lower miscarriage rates, nor improve the odds an IVF cycle will work, some question the value of the test for younger women. However, in this population PGS is most useful in promoting single embryo transfer because multiple embryo transfers in this group are much more likely to culminate in twins and create needless risk for mother or offspring. It can also be more helpful in this group for family planning, taking additional children into consideration.